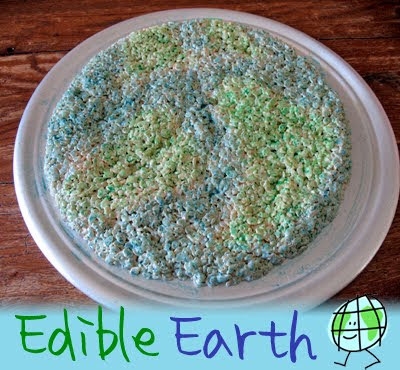 One great, big Rice Krispy treat shaped and colored like the Earth… genius! I can’t take full credit for this idea, I actually found it on The Idea Box (if you visit their link, the photo you see there is mine, I work for them) while going through and deciding on a few crafts to make and photograph for the site. When I told Dominic, my 11 year old about it, he wanted to help. I love how his eyes light up when I tell him he can help. He’s my youngest and the only one left of the four that still wants to putter around in the kitchen with me! 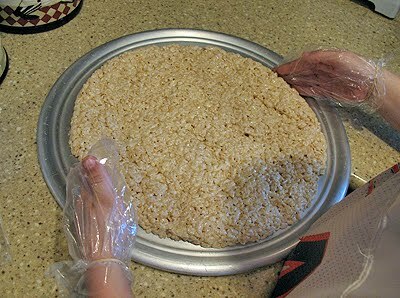 You basically just make Rice Krispy treats, shape it into a circle on a pizza pan, then use a clean paintbrush or pastry brush to paint on some lightly watered down food coloring. 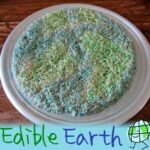 If you’d like to make a fun Earth craft with your kids, try my textured globe earth craft, or if your kids are little, they’ll love this coffee filter Earth from The Idea Box! Melt the butter of medium heat in a stock pot. Add the marshmallows and continue cooking, stirring constantly, until marshmallows are melted. Remove from heat and add cereal. Stir to combine them dump out onto the pizza pan. Have child put baggies on their hands, secure them around their wrists with rubber bands. Spray the palm side of the baggies with cooking spray. Have child shape the cereal mixture into a large circle on the pizza pan. Don't pack the cereal mixture down too hard or they will become tough and hard to chew. Add a few drops of blue food coloring to one of the dishes of water, and add a few drops of green to the other. Use a clean pastry brush to "paint on" the land and the water. While I usually reserve this for my craft blog, I’m submitting this to the following craft carnivals. To see some other awesome projects, be sure to visit them! Thanks for the idea, we did this with the kids today, but made "mini" Edible Earth's for them. We cut the treats into 4 inch circles (with a cup or other object) and they each got their own to color! It was fun! This is a cute idea. It totally looks like an earth. Oh this is simply genius! P.S – Your site's been taking a real long time to load. What a super cute idea!!! Thanks for linking this up to Be Inspired last week as well! 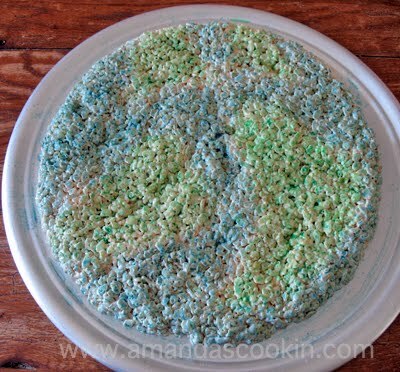 I just love Rice Krispie treats and this is perfect for Earth Day! Adorable! Such a cute idea.